Ordnance: War + Architecture & Space investigates how strategies of warfare occupy and alter built and other landscapes. Ranging across the modern period from the eighteenth century to the present day, the book presents a series of case-studies which operate in and between a number of settings and scales, from the infrastructures of the battlefield to the logistics of the domestic realm. 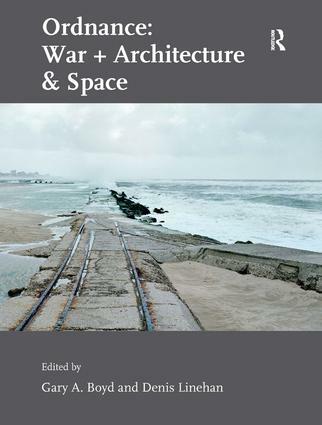 The book explores the patterns, forms and systems that articulate militarised spaces, excavates how these become re-circulated and reconfigured within other domains and discusses the often ephemeral legacies and residues of these architectures. The complexities of unpicking the spaces of the 'fog of war' are addressed by an inter-disciplinary approach which deploys graphic and textual analyses and techniques to provide new and unique perspectives on a hitherto underexplored aspect of architectural and spatial discourse: the tactics and programmes through which the built environment has historically been made to respond to the imperatives and threats of conflict and, in the context of the 'war on terror', continues to be so in ever more pervasive ways. Contents: Introduction: a place called war, Gary A. Boyd and Denis Linehan; Part I Urban Orders: Militarised Terrains in the City: To gather in war and peace; the city squares of Savannah, Georgia, Nathaniel Robert Walker; The political aesthetics of counter-terrorism, Peter MÃ¶rtenbÃ¶ck and Helge Mooshammer; Protecting the population: bureaucracy, affectivity and governing the Liverpool blitz, Peter Adey (with Barry Godfrey and Dave Cox); Funky bunkers: the post-military landscape as a readymade space and a cultural playground, Per StrÃ¶mberg. Part II The Invisible Front: Domesticity and Defence: ’Hiding the assets’: 'self-concealing' architecture and the British landscape in the Second World War, James Robinson; Home base: militarization of the American home in the Second World War, Rebecca Lyn Cooper; The art and science of invisible landscapes: camouflage for war and peace, Sonja Duemplemann. Part III War in the Landscape: Infrastructures and Topology: The Atlantikwall: from a forgotten military space towards places of collective remembrance, Rose Tzalmona; Military intelligence: the Board of Ordnance maps and plans of Scotland 1698-c.1760, Carolyn J. Anderson; Commanding the rivers: guarding the German railway network in peace and war, Volker Mende; Forteresse invisible: the casemates of the Maginot Line in Alsace-Lorraine, Lisa Haber-Thomson. Part IV Trauma: Spaces of Memory: Defending the Irish border: the map of watchful architecture, Garrett Carr; British soldiers' graves in the Crimea and the origins of modern war commemoration, Andrew Keating; Contested spaces: invisible architectures, Reenie (Karin) Elliott; Sketches of war: the graveyards of historical memory, Jonathan Charley; Index.